The Best Police Report Writing Book With Samples: Written for Police by Police, This Is Not an English Lesson! Dimensions 0.75 by 7.75 by 9.75 in. Amazon.com description: Product Description: A revised, professionally developed, easy to use, easy to understand police report writing book.ÃÂ This book is current, relevant and will show anyone at any level of law enforcement how to successfully write a police report.ÃÂ You will learn how to effectively document your call from the moment you are assigned that call until you are 10-8. This book was created and written by a police officer who improved and simplified report writing training. Targeted, easy to read, entertaining, with effective lessons and samples throughout. No annoying self tests, no vague instructions just simple, concise, complete police report writing with a bit of cop humor thrown in. 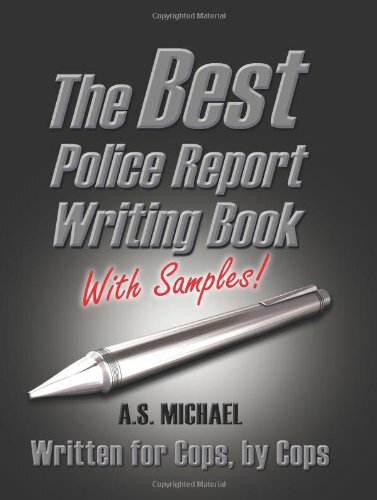 This book will quickly teach you how to write an effective, factual police report line by line, segment by segment.ÃÂ You will easily learn why you are writing a police report, what to include, what not to include.ÃÂ You can even browse the numerous applied samples included in the book. These are funny "police call" stories with incorporated narrative samples explaining how your report should look when you are finished.ÃÂ Generic enough for any agency police or sheriff. Specific enough for all crimes.ÃÂ Simply the easiest instruction out there. Great for new, academy or any English Second Language officers who want a proven method to learn to write a police report quickly, simply with significant results. from Createspace Independent Pub (April 1, 2009); titled "The Best Police Report Writing Book With Samples: Written for Police by Police, This Is Not an English Lesson!" About: A revised, professionally developed, easy to use, easy to understand police report writing book.